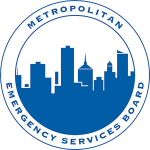 The Metropolitan Emergency Services Board (MESB) was established by Joint Powers Agreement for the purpose of overseeing the 9-1-1 system, the metro portion of the Allied Radio Matrix for Emergency Response (ARMER) system, and EMS in the metropolitan area of Minneapolis/St. Paul. The Board consists of commissioners from the counties of Anoka, Carver, Chisago, Dakota, Hennepin, Isanti, Ramsey, Scott, Sherburne, Washington and a council member from the City of Minneapolis. Provides 9-1-1 network oversight, establishes standards and guidelines for 9-1-1 services and coordinates the 9-1-1 database to ensure accuracy and integrity of the 9-1-1 system. Oversees and manages the regional interoperable radio system, establishes standards and guidelines for radio system operation and encourages and facilitates participation among all metro area first responder agencies. Coordinates regional EMS activities, serves as an information clearinghouse and supports EMS providers with monetary and programmatic resources to enhance the regional EMS system. Provides a forum for problem-solving and discussion by facilitating meetings for radio users, PSAPs and EMS providers and coordinates activities between agencies involved in providing 9-1-1, radio service and EMS. Public Trust: We strive to maintain the confidence of the public through system reliability, consistent service and data integrity. Collaborative Government: We support the synergy and economies of scale and effort of region-wide coordination while preserving the autonomy of individual organizations. Commitment: We strive to be responsive in our work and maintain a helpful and honest approach. Innovation: We support visioning and research as part of our commitment to the use of the best technology and practices in our business.